The series features the New Directions glee club at the fictional William McKinley High School in the town of Lima, Ohio, and graduates of McKinley who have moved to New York City, some to attend the fictional New York Academy of Dramatic Arts. Unlike previous seasons, the fifth continues the school year begun in season four. The season shows the reigning champion William McKinley club finishing second at nationals before the club is permanently disbanded for school budget reasons (episode 12), leaving the focus on graduation and the alumni for the remainder of the series. Throughout the season, the club and its alumni deal with relationships; death and mourning; body image, gay bashing, intimacy, and other social issues. The central characters are glee club director Will Schuester (Matthew Morrison), cheerleading coach and school principal Sue Sylvester (Jane Lynch), glee club members Artie Abrams , Blaine Anderson (Darren Criss), Tina Cohen-Chang (Jenna Ushkowitz), Sam Evans and graduates Rachel Berry (Lea Michele), Kurt Hummel (Chris Colfer), and Santana Lopez (Naya Rivera). Previously recurring characters Jake Puckerman (Jacob Artist), Marley Rose (Melissa Benoist), Ryder Lynn (Blake Jenner), Wade "Unique" Adams (Alex Newell), and Kitty Wilde (Becca Tobin), all glee club members, have been promoted to the main cast in the fifth season. Heather Morris, Amber Riley, Mark Salling, and Harry Shum, Jr., who play Brittany Pierce, Mercedes Jones, Noah "Puck" Puckerman and Mike Chang, respectively, are no longer series regulars, but have been appearing as guest stars. 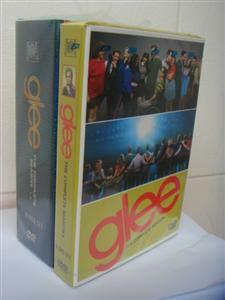 Glee season 1-6 DVD box set is available now! Glee Season 5 Will Come Back! American Idol's Star Comes to Glee!